Moving the Needle: Skip Schymaker hits one for Albert, +.426 WPA. The Cardinals entered the ninth with a 4-3 lead, with the 8-pitcher-1 spots coming up. In one of those moments where we remember why we love baseball, Fernando Salas surrendered a homer to Alcides Escobar, who hadn’t hit one since September 4th of last season. It was a no-doubt shot, too, into the left field corner. Salas retired the next three straight, which came in handy the next inning when Schumaker slammed a sweet, delicious cookie over the wall in right-center. It was his first career home run off a left-handed pitcher (390 PA). Albert Pujols: 3 for 3, 1 HR. That was his eighth homer in June. Of course, the story was the wrist injury he sustained. That could keep him out for a few weeks, which is just something that the Cardinals, now tied atop the NL Central, simply do not need. 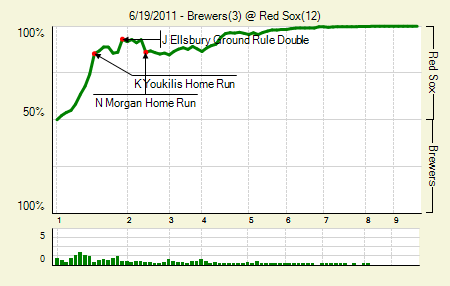 Moving the Needle: Kevin Youkilis delivers in a big first inning, +.110 WPA. How much differently might this game have gone if Yovani Gallardo had caught Prince Fielder’s throw in the first? If you believe it would have proceeded as normal, just with an out and without Gonzalez on base, it would have saved the Brewers three runs in the first. If, on the other hand, you invoke the fallacy of the predetermined outcome, it could have meant all the difference in the world. But Gallardo did drop that ball, and Kevin Youkilis did follow up by popping one over the Monster, giving the Red Sox an early 4-0 lead. They’d bat around in the first, scoring six and putting this one out of reach before it really got started. Dustin Pedroia: 3 for 4, 1 2B, 1 HR. He has four doubles, a triple, and two homers in his last eight games. His SLG is still under .400, but it’s starting to climb with his recent surge. Tim Wakefield: 8 IP, 3 H, 3 R, 1 BB, 6 K, 2 HR. A couple of Brewers (Fielder, Nyjer Morgan) hit it hard, but for the most part they went down quickly against the knuckleballer. Moving the Needle: Paul Konerko extends the lead in the seventh with a homer, +.132 WPA. This one was a little redemption for dad, who was hit with a foul ball on Saturday. Konerko’s shot in the seventh put the White Sox up 2-0, and by the end of the inning they’d take a 3-0 lead. 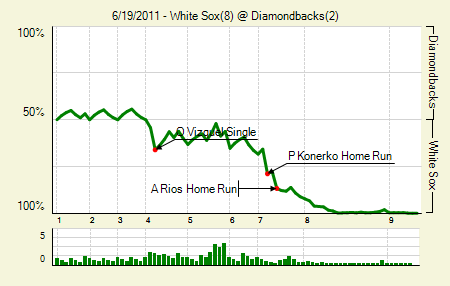 Konerko’s homer was just the appetizer to their big eighth inning, in which they scored five runs. Konerko, coming to the plate with runners on first and second with one out, was walked intentionally in that frame. Alex Rios: 1 for 4, 1 HR. Before the weekend he hadn’t homered since May 21, but he had two on the weekend. The homers raised his ISO to .115, which goes a long way in explaining Rios’s horrible numbers this year. A.J. Pierzynski: 2 for 4, 2 2B. He drove in three on the game. Phil Humber: 7.2 IP, 7 H, 2 R, 1 BB, 5 K. A 5.4% HR/FB rate is helping power his season, but he has quality numbers all around. The biggest difference, however, might be in his hit prevention: the league is hitting just .202 against him. Moving the Needle: Cord Phelps ends it with a homer in the 11th, +.297 WPA. Coming into the series, the Indians and Pirates were on opposite tracks. The Indians, hot starters, were falling a bit, losing their grip on the AL Central in late May and early June. The Pirates were on the rise, a game over .500 heading into the series. They left it a game under, losing all three to the Indians. It took 11 innings yesterday, but the Indians came through with the sweep. The walk-off hit came from Phelps, his first big league homer in his 24th PA. Those were the game’s first runs since the second inning. Carlos Santana: 2 for 3, 1 2B, 1 HR, 2 BB. Phelps’s homer might have been the difference, but the Indians wouldn’t have gotten there if not for their pair of runs in the second, the first of which came from a Santana homer. Jeff Karstens: 7 IP, 5 H, 2 R, 2 BB, 4 K. It’s tough to complain when you allow two runs, and one of them scores on a double play. 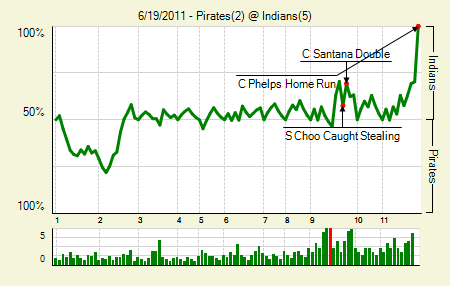 Karstens did all he could, but the Pirates just couldn’t come through against the Cleveland bullpen (6 IP, 4 H). 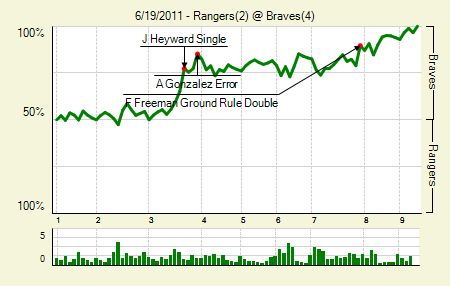 Moving the Needle: Jason Heyward’s third-inning hit gives the Braves’ lead, +.121 WPA. Elvis Andrus came reasonably close to catching Heyward’s soft liner, but it fell just out of his reach. That allowed the men on second and third to score, opening up a 2-0 lead for the Braves in the third inning. They’d add another when Michael Young and Yorvit Torrealba collided while trying to catch an infield pop-up. Freddie Freeman: 3 for 4, 1 2B. He drove in an insurance run later in the game, after the Rangers had made it a 3-2 game. 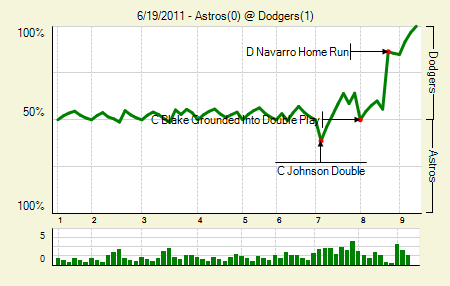 It was actually kind of unlucky, too, because it bounced into the stands for a ground rule double. With two outs, Heyward surely would have scored from first had it stayed in the yard. Nelson Cruz: 2 for 4, 2 2B. Naturally, both doubles came with the bases empty. 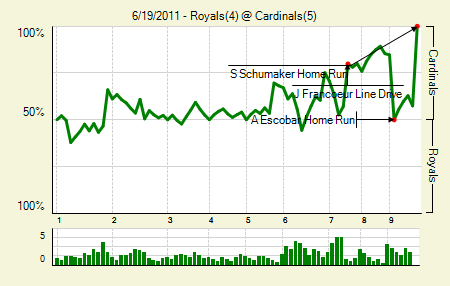 Moving the Needle: Drew Butera‘s ground ball single brings home the winning run, +.292 WPA. 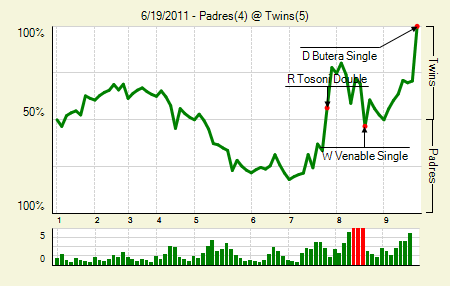 Tied 4-4 in the bottom of the ninth, the Twins got started right when Delmon Young singled. They then sacrificed him to second, which surely raised the ire of a few Twins fans I know. At least they weren’t giving up an out when they were down a run and had just three left. In any case, after an intentional walk Butera came to the plate. He hit one on the ground that bunced off Chase Headley’s glove and into shallow left, giving Young plenty of time to score from second. That’s seven straight for the Twins, all of which have come with Justin Morneau on the DL. We’ve seen the Twins succeed without Morneau during the past two seasons. Francisco Liriano: 7 IP, 8 H, 3 R, 2 BB, 8 K. Since coming back from the DL he has gone 3 GS, 20 IP, 13 H, 5 R, 5 BB, 24 K, 0 HR. The ground balls aren’t quite there, but his season is still taking a turn for the better. Dustin Moseley: 6.1 IP, 3 H, 3 R, 2 BB, 3 K, 1 HR. He allowed a homer in the first, and then didn’t allow another hit until the seventh. A leadoff double hurt him there, but an error was what drove him from the game. His replacement, Mike Adams, promptly gave up the lead. Moving the Needle: Alfonso Soriano gives the Cubs a lead with a three-run shot, +.265 WPA. The Cubs answered the Yankees’ first-inning run with one of their own, and then took the lead in the third. 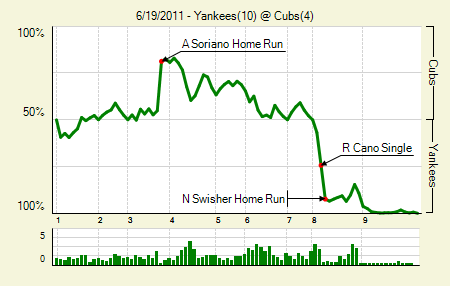 CC Sabathia was quite hittable that inning, allowing two solid singles before Soriano hit a no-doubter to left-center. The homer made the score 4-1. Geovany Soto followed with a hard-hit double, but Sabathia settled down after that. The Yanks answered with a pair in the next half-inning, and then jumped out to a lead in the eighth. Of course, that tie-breaking, three-run homer was only +.181 WPA — because, I suppose, it came with none out while Soriano’s came with two. Still, it seems as though a tie-breaking three-run shot in the eighth is a bit more important than the equivalent in the third, because the opponent has fewer outs remaining. Nick Swisher: 3 for 5, 1 HR. He drove in four, including that three-run homer in the eighth. In his last two series he’s 8 for 20 with three doubles, two homers, and seven walks. Alex Rodriguez: 3 for 4, 1 2B, 1 BB. He scored three runs. Despite a bum shoulder he’s hitting .325/.397/.556 in his last 30 games (7 for 20 with two doubles in his last two series). 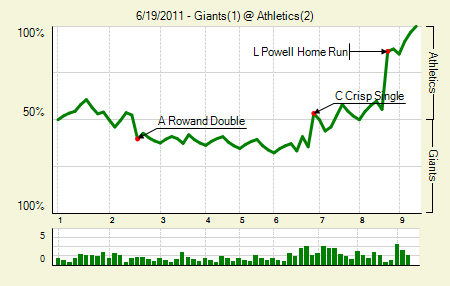 Moving the Needle: Landon Powell’s eighth-inning homer puts the A’s ahead, +.310 WPA. It takes quite a charge to put one out at the Colisseum. Case in point, watching the highlights of this one with a friend, he blurted out, “that’s gone,” when Aubrey Huff put a charge into one in the sixth. Of course, it made only the warning track. Powell’s shot was to a slightly shallower part of the park, but he got all of it nonetheless. That gave the A’s a 2-1 lead with just three outs left to record. Trevor Cahill: 8 IP, 5 H, 1 R, 1 BB, 7 K. After a few disappointing starts it was nice to see him get back on track. Jemile Weeks: 3 for 4, 1 2B. That’s three doubles in his last four games. The A’s had just five hits total in the game. Matt Cain: 7 IP, 3 H, 1 R, 0 BB, 5 K. It’s hard to overlook this one. Other than Weeks, he handled the A’s offense with aplomb. Moving the Needle: Miguel Cairo puts the Reds ahead with a homer, +.354 WPA. Cairo played third base in this game. The normal third baseman, Scott Rolen, is a good hitter and therefore bats fifth. Since Cairo was his replacement, Cairo therefore bats fifth. So goes a bit of Dusty Baker logic. 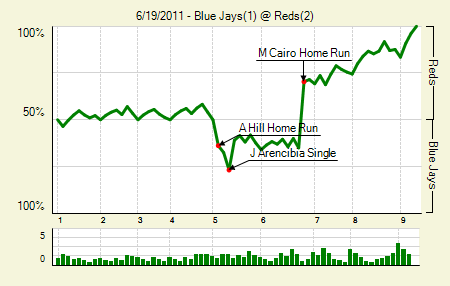 It worked out well enough in this one, as his long homer in the sixth accounted for the Reds’ entire offensive output. The pitching handled it the rest of the way. Bronson Arroyo: 8 IP, 5 H, 1 R, 1 BB, 5 K. That’s his second good start out of four, since I was all hating on him. Still, he allowed a homer in this one. Aaron Hill: 1 for 4, 1 HR. That’s just his third homer this year, after hitting 26 last year and 36 in 2009. 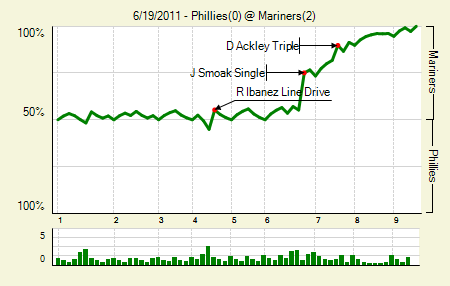 Moving the Needle: Justin Smoak‘s little bloop puts the Mariners on the board, +.199 WPA. It was just out of Jimmy Rollins’s reach, and it got the job done. Ichiro came around to score from second, breaking the scoreless tie in the sixth. The hit was all that the M’s would need, as they got a pitching performance that would make even Philly’s staff envious. Jason Vargas: 9 IP, 3 H, 0 R, 2 BB, 6 K. That’s his second complete game shutout in his last four starts. They are the only complete game shutouts of his career. He retired 15 straight at one point, a string that Ryan Howard broke with a single in the ninth. Cole Hamels: 6.1 IP, 7 H, 2 R, 0 BB, 6 K. Six of those hits were singles. Only Dustin Ackley broke through for extra bases, though it did lead to the second Mariners run. Moving the Needle: Miguel Cabrera sets ’em up with a double, +.093 WPA. 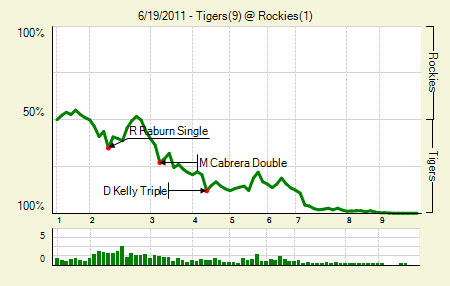 The Tigers slowly added up runs early in the game, picking up small victories in the second, third, and fourth. Their pair in the second came after Miguel Cabrera doubled with none out, setting up runners on second and third. A sac fly and a single brought both base runners home, giving the Tigers a 3-0 lead. They’d get three in the seventh as well, though with Verlander on the mound it wasn’t quite necessary. Justin Verlander: 9 IP, 4 H, 1 R, 0 BB, 5 K. A Ty Wigginton solo homer was all the Rockies would get. Only one other base runner made it past first base, and even that came on an error. That’s his second straight complete game. In his last five starts he’s pitched into the eighth and has gone 41.2 IP, 22 H, 4 R, 3 BB, 44 K.
Brennan Boesch: 3 for 4, 1 HR. He drove in three runs. Moving the Needle: Casey Kotchman singles home the go-ahead run, +.240 WPA. It was just a little inside-out grounder, an easy out if it’s a few feet to the right. But Kotchman’s hit down the third base line allowed the go-ahead run to score in the eighth. It was a good thing, too, because the Rays didn’t want to waste that pitching performance. James Shields: 9 IP, 4 H, 1 R, 0 BB, 10 K. That’s his fifth complete game of the season, and despite the gaudy numbers it wasn’t even the best of them. It looks like Cameron was just a year off with his prediction of Shields as AL Cy Young in 2010 (though, of course, it’s anything but a sure thing at this point). 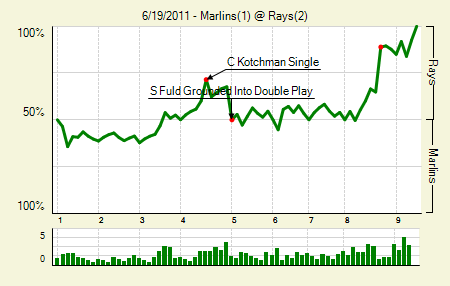 He did get some defensive help from Sam Fuld in this one. Chris Volstad: 7 IP, 6 H, 1 R, 4 BB, 4 K. Sadly, this is about as good as it gets for Volstad. Moving the Needle: Dioner Navarro supplies the only run with a solo blast in the eighth, +.307 WPA. With Rod Barajas on the DL, Navarro figures to get plenty of playing time. He started it off right yesterday with a solo blast in the eighth, putting the first run of the game on the board. That raised his ISO to .100 on the season. Hiroki Kuroda: 7 IP, 3 H, 0 R, 2 BB, 6 K. He’s in the midst of an excellent season, which helps the Dodgers not only in the standings, but perhaps also at the deadline, when he could be one of the top starters available. Bud Norris: 6 IP, 1 H, 0 R, 1 BB, 5 K. Things are really coming together for him this season, as his ERA, FIP, and xFIP are all reasonably close (and low). In his last three starts he’s gone 21 IP, 7 H, 2 R, 8 BB, 16 K.
Chris Johnson: 2 for 4, 2 2B. It’s hard to ignore this offensive output in a mostly hitless game. Seriously, there were six hits total in the game, so Johnson’s two doubles are the definition of notable. Moving the Needle: Danny Espinosa ties the game with a double, +.143 WPA. After the Orioles jumped out to an early 2-0 lead, the Nats staged a comeback in an attempt to keep their win streak alive. A pair of doubles, the second of which came from Espinosa, tied the game at two. The Orioles took back the lead the next half-inning, though, and kept it the rest of the way. Espinosa’s .350 wOBA ranks sixth among MLB second basemen, just a point behind Dustin Pedroia. His .233 ISO leads them all. Roger Bernadina: 3 for 4, 1 HR. That’s three homers in his last four games. J.J. Hardy: 2 for 4, 1 2B, 1 HR. After two down years he’s again starting to look like the hardy of old. Though, really, that consists of one really good season. His .377 wOBA would lead all AL shortstops if he qualified. Mark Reynolds: 3 for 4, 1 2B, 1 HR. The extra base hits are no surprise, since that’s what Reynolds does. But he has four straight games with a single. It’s an oddity for him. Before this he hadn’t singled in more than two straight games this season. Moving the Needle: Erick Aybar’s triple clears the bases, +.224 WPA. 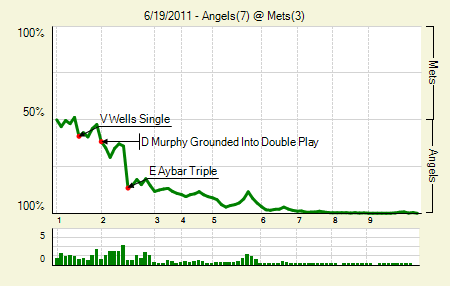 The moment Aybar’s grounder down the right field line got into the corner, it was surely a triple. With the bases loaded, that meant three runs and a 4-0 Angels lead in the second. They’d eventually take a 7-0 lead, surrendering runs only in the ninth. Tyler Chatwood: 7 IP, 4 H, 0 R, 4 BB, 4 K. The walks aren’t too enticing, but he worked around all of them, holding the Mets hitless in seven tries with runners in scoring position. Vernon Wells: 3 for 4, 1 HR. That’s his third home run since coming back from the DL. Unfortunately, those are his only extra base hits in that span. We hoped you liked reading The Morning After: Game Recaps for June 19th by Joe Pawlikowski! 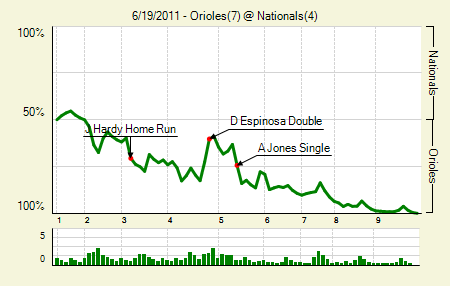 The graph for the Nats-O’s game is wrong. There’s a missing play or something. 7-4 was the final, and Espinosa’s double did not tie the game, but made the score 3-2. I noticed a few similar errors (e.g., innings with just two outs recorded), but clearly don’t have time to check the accuracy of every play recorded. Yes, that’s fair of course. I wonder where things went wrong.